An excellent 1855 first edition example of Colton's rare map of Philadelphia, Pennsylvania. Covers the city from the Schuylkill River in the northwest to the Delaware River in the southwest, and from Somerset Street to Mt. Keon Street. 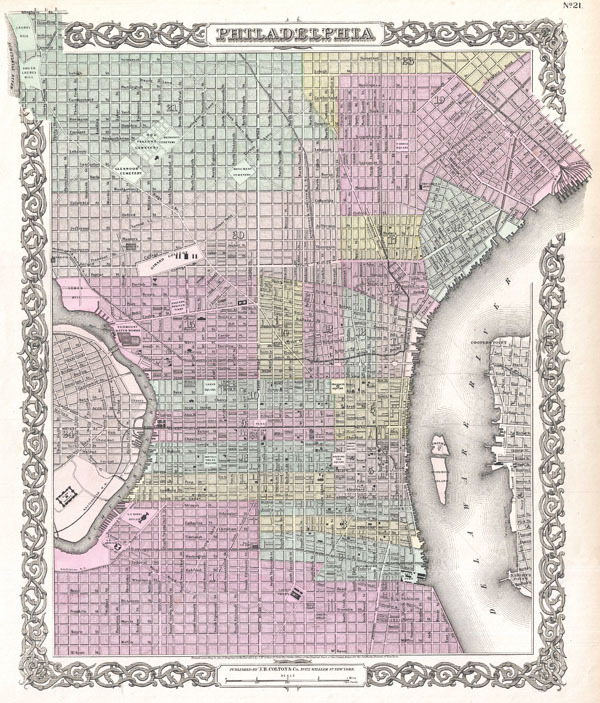 Hand colored in pink, green, yellow and blue pastels to identify city wards. In general this map offers extraordinary detail at level of individual streets and buildings. Identifies the Navy Yard, the Country Prison, Girard College, the Reading Railroad, the Alms House, Fairmont Waterworks, and the Odd Fellows Cemetery. Surrounded by Colton's typical spiral motif border. Dated and copyrighted to J. H. Colton, 1855. Published as page no. 21 in volume 1 of the first edition of George Washington Colton's 1855 Atlas of the World. Very good condition. Minor marginal waterstain in upper lert quadrant. Does not extend into printed area. Blank on verso.